Palazzo Citta Siena Apartments are located in the heart of the historical center; offering three (private entrance) apartments to choose from…..
PRIMA Suite: is suitable for 2 persons; overlooks via di Citta’ w/ master bedroom, showered bathroom, living room and separate kitchen (see photos in the gallery below). ** Booked for July and August Palio 2019 and August Palio 2020. LUXURY Suite: suitable for up to 5 persons; w/ master bedroom (king bed) and en-suite bathroom (shower), a double/queen bedroom; 1 bedroom w/ single day bed; 2nd bathroom w/ shower/jacuzzi; living room and kitchen. (photos above and in the gallery below). ** Booked for July Palio and August Palio 2019; Booked for August Palio 2020. Each apartment has its own private entrance, but naturally can be rented together in any combination to accommodate families or small groups traveling together. The apartments are in an historic palazzo and located on the 3rd floor; there is not an elevator. Management is prepared to assist you with your luggage on your arrival and departure. Palio Package Prices & Dates: includes up to 5 nights; July Palio (June 28 – July 3); August Palio (August 12 – 17) your travel dates may differ (or you may wish to stay less nights; the cost is the same. 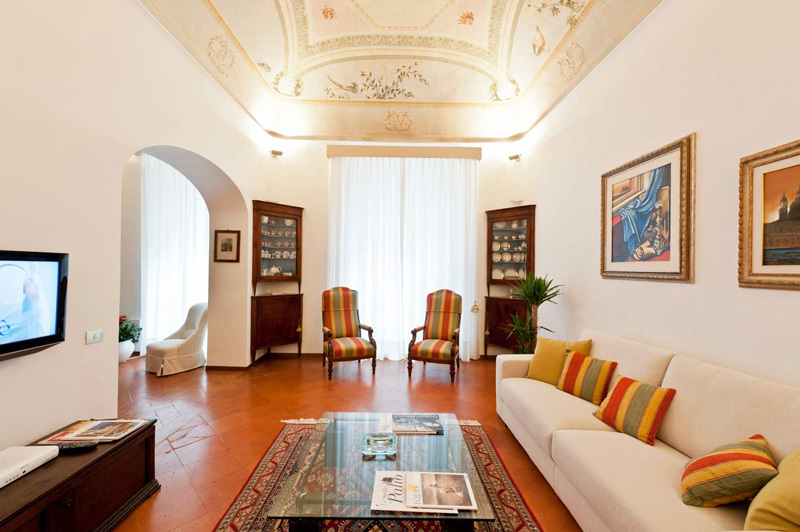 The Palazzo Citta Siena apartments DO NOT overlook the Campo – but the apartments can be rented for overnight and then combined with individual Palio Tickets to view the Campo where Siena’s Palio horse race takes place (July 2 or August 16). The package price includes Palio Tickets (reserved seats) in the Grandstands (other ticket options can be selected on the Reservation Page).